A recurring claim within the pop-punk scene today is that bands are losing sight of the music that they used to make, or that they have moved in a different direction than was anticipated or desired by fans. Albany natives State Champs’ third full-length album, Living Proof, sets out to respond to that remark, showing that a band is capable of pushing the boundaries of their sound, while still remaining true to their roots. The album kicks off with “Criminal,” a song that begins very softly, with the exact kind of smooth, sing-along melody that fans have come to expect from vocalist Derek DiScanio, before launching into a roaring, fast instrumental reminiscent of the band’s earliest works. The blend of these two dynamics proves that a rock band can blend radio-friendly pop melodies with a more punk-rooted sound that appeals to a wide range of people. This marriage of sounds is something that is seen throughout the album, with songs like “Frozen” and “Something About You” laced with groove-oriented bass lines that command the listener to dance, and “Dead and Gone” offering an enormous sing-along introduction. In contrast, songs like “Lightning” and “Cut Through the Static” are characterized by fast-paced guitars and aggressive drums providing a backbone for the mosh pits and crowd surfers that will surely take place to these songs. The album does take some dramatic turns with dynamic shifts like the ballad “Our Time to Go,” and the electronic-tinged “Time Machine,” featuring a guest vocal by none other than Mark Hoppus of blink-182. Unfortunately, this is one of few moments on the record that falls short of realizing its full potential, feeling slightly forced and out of character for a band such as State Champs. Lyrically, the album deals with a variety of topics, from new love and old love, to self-worth and improvement. The lyrics are some of the band’s most honest and most meaningful to date. “Our Time to Go” proclaims “I don’t want to live this way, strong enough to break these chains” and “Cut Through the Static” states “I’ll be your medicine if you help write the alternate ending.” This theme of optimism in times of hardship is scattered throughout the entirety of the album, and is sure to resonate with listeners. Overall, Living Proof does not disappoint. It offers everything that is to be expected of the band, while simultaneously pushing their sound and creativity into new and unexplored territories. 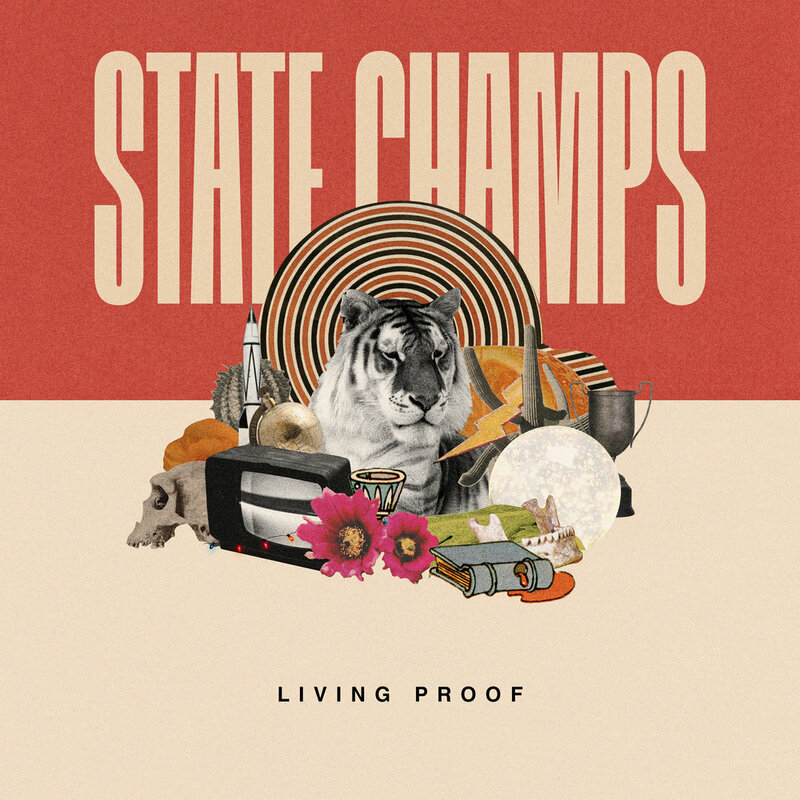 While some of these more experimental efforts may miss their mark, this album does an exceptional job of presenting a refined and definitive version of State Champs. Living Proof is out everywhere this upcoming Friday (6/15). Get it, and other State Champs merch items on their website.